Pembe Ev is a charming, comfortable and surprisingly private villa, set amidst natural olive tree parkland on two sides and at the end of small little used residential road. Located within an easy 5-10 minute walk of the town centre there are also shops, cafe and restaurants right on your doorstep. Once the owners permanent home it is well equipped throughout and maintains a real 'home from home' feeling. A large pool terrace for outdoor living faces south and west surrounded by mature oleanders and bougainvillea. A large covered pergola offers much needed shade in the peak summer heat and is ultimately private. The roof terrace has a large day bed from which to enjoy the stunning sea views across the bay and has already led to a marriage proposal from some of our previous guests! All in all Pembe Ev is a favourite holiday choice and our guests return year on year with the feeling that they are coming home. Early booking is advised. I am Bridget Karaaslan and with my husband Sakir, run a well established estate agency called Black Lion in Kalkan. I own and/or manage a very small selection of Kalkan properties catering for between 2 to 4 people, with a variety of locations and suitable for various budgets. Unlike most 'rental agencies' I know the properties intimately and in many cases personally own and manage them. Pembe Ev belongs to my mum Jane who bought it on my insistence that she needed a place in Kalkan to be close to me - but not actually living with me! Pembe Ev has such a convenient location for the town and shops and surrounding parkland gives it privacy. We have planted many trees around the house and it has matured into a small paradise. In 2012 my mum decided to move permanently to Kalkan and purchased a larger home but Pembe Ev remains in the family now for holiday rentals as no one could bear to part with it. Pembe Ev is and easy walk to town yet far enough from the bustle of the town centre to be peaceful. Situated at the end of an unmade road and surrounded by parkland which we have planted with trees, Pembe Ev has matured into a beautiful little villa offering tranquility, peace and privacy to all who visit. The pool terrace area is large offering sun and shade and the roof terrace a pure delight with stunning views of Kalkan Bay. You might say the best things come in small packages and this is definately the case with this little villa. Main family bathroom with 90cm shower enclosure, WC and sink. Second bathroom with 90cm shower enclosure, WC and sink. Three and 2 seater sofas, central and side coffee tables with lamps. Kilim carpet. TV with DVD player and satellite (programs including BBC prime and news channels). Cassette/CD player. Ipod player. Cupboard with books, games and many DVDs. Full electric oven, gas hob and extractor, dish washer, microwave, fridge/freezer and 19 litre water cooler. Electric kettle and toaster, caffettiere, well equipped kitchen utensils. Notes on accommodation: Fully air-conditioned throughout. We do not consider the villa suitable for very young children. Please contact me for further information. There is a hairdryer at the villa. Outside: Small private pool with a shallow end (approx 150cm deep). Pool terrace with 40sq.m pergola (a great shaded area) with dining table and chairs for 6, BBQ, coffee table plus 4 wooden sun beds, 2 sun bed tables and two large umbrellas. Bedroom 1 balcony has a two seat sofa. Roof terrace has wrought iron day bed, 2 armchairs, coffee table and very large 4m counter levered umbrella. Utility Room: Washing machine, ironing and ironing board plus clothes airer. Cleaning / Towels / Linen / Maid service: All towels and bed linen are provided. Pool towels are provided. Weekly laundry and cleaning are included. Extra cleaning or laundry changes on request at an additional cost. Our 5th visit to Kalkan, but our first to Pembe Ev, this villa is in very quiet location, with a very easy walk into the town. The villa itself is spotless, the pool and terrace area are cleaned daily. There are lovely areas to escape to when the hot weather becomes just a little too much. Inside the villa is everything you need, from Internet, tv ,water cooler, books and even a torch. The roof terrace has amazing views and it is lovely to watch the boats returning back at the end of the day. Communication with Bridget was excellent , so if you would like a piece of paradise in Kalkan visit Pembe Ev you will not be disappointed. Our dates are already booked for 2019. Pembe Ev is in a quiet location at the end of a cul-de-sac yet just a ten minute walk to the centre of town. Pool and terrace cleaned daily, spectacular views from the roof terrace and fully equipped with A/C, water cooler, internet, satellite tv, books, dvds, friendly cats! The second bedroom is small but only in comparison to the large main bedroom. My two sons in their 20’s had no problem, it was the only slight worry we had before arrival but completely unfounded it was more than adequate. This was our first visit to Kalkan and southern Turkey. We hired a car and there are plenty of places nearby to visit. Our favourite was Saklikent Gorge where it is easy to spend a day rafting, walking and relaxing in one of the restaurants. The roads are fine with good links to Fethiye, Tlos, Xanthos, Kas and the mountains. We arrived in Antalya which was a three hour drive but that saved the late flight arrivals common in Dalaman and the roads are good if you are considering this option. Overall an excellent holiday thanks Bridget really enjoyed it. This was our second visit to Pembe Ev and were once again delighted with our stay. The house is at the end of a road so is very private and is presented in very good order throughout. The terrace and pool are cleaned each morning so it is a lovely way to spend the day lazing by the pool and reading a book. Our evenings were spent on the roof terrace drinking a glass and watching the sunset over Kalkan bay. In relation to the rest of Kalkan the house is also a "reasonably" level walk to the top of the town centre, but if you are feeling a little lazy you can get a taxi from the waterfront for approx. £2-3. Overall a great place to stay and we would gladly return for a third time! a positive review. I would love to know what we would need to have done to have earned a 5 star rating from you. Kind regards Bridget. Pembe Ev is a traditional 2 bed Turkish home full of homely comforts. It was very spacious, clean, (in addition two cleaner's came mid way through our two week stay for a period of two hour's) with everything to hand we could possibly have needed. The beautiful spacious pool and patio area's surrounding the villa were cleaned daily and there were plenty of sun loungers and cushions available. Access to the villa was ideal being a flat 10 minutes walk from the centre of Kalkan and lay at the end of Nulifer Street, a beautiful residential area near to a number of quality hotels. The roof top terrace with it's deep cushioned seating area was an added bonus with views to die for. We spent a wonderful two weeks here and have to say were sad to leave. So glad you enjoyed your first stay with us. Thank you for the review. This is our 3rd Stay at Pembe Ev - that says it all. The property is in a lovely quiet location and not too far from the town centre. The property has everything you need for your holiday stay. The swimming pool is simply wonderful and gets the sun all day. Bridgette the owner is available during your stay should you have any problems - but we never needed her as did not have any issues during our stays. All in all very happy to recommend this holiday rental to all - we hope to return again in 2019. Kalkan is ideal for all types of water activities. The Bay has a Blue Flag Award for cleanliness and is ideal for a PADI diving course or learning to sail or water ski. Keen walkers & hikers can explore parts of the ancient Lycian Way which passes directly through the town. On Patara Beach are early morning horse ridding sessions and in the summer Yoga classes are available on the sea front at Villa Mahal. Kalkan will inspire any photographer or painter with numerous photo and painting opportunities so don't forget to bring your camera and brushes. Turkish cooking classes are usually available through Guru's restaurant along with wine tasting evenings. 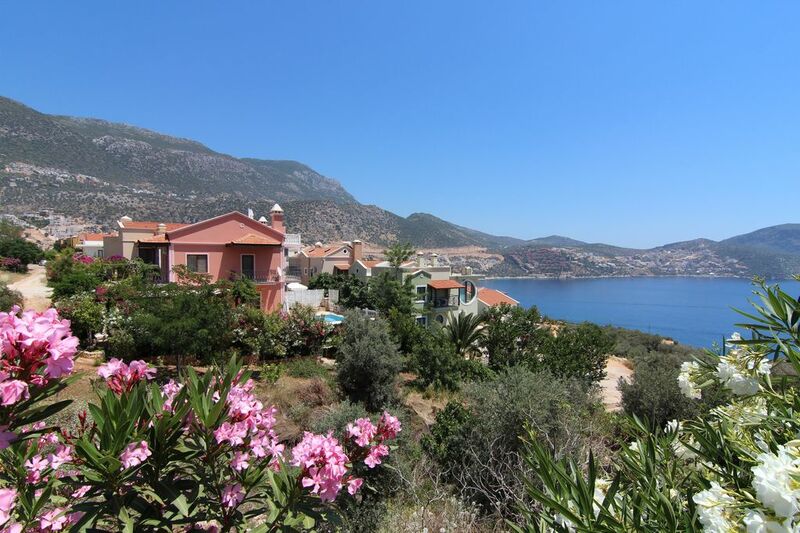 The villa is within a 5 minute walk of the Yali Beach Club and 10 minute walk to Kalkan beach and the harbour. From the harbour you can catch the water taxis to Palm Beach, Patara Prince beach, Villa Mahal and Kalkan Park beach clubs. The nearest sandy beach is Kaputas, a small beach at the bottom of a gorge with turquoise blue water and just 5 minutes by car/local bus. The 18km sandy beach at Patara (protected nature reserve and totally unspoilt) is a 20 minute car/local bus ride away. Nearest airport is Dalaman a 75-90 min car journey. An alternative is Antalya a 2½ - 3 hours drive by car. We advise a private airport transfer on arrival to the villa, which we can arrange - although it is possible to travel with local transport or to hire a car at the airport and drive yourself. A car is not necessary for staying the property and you can hire a car on a daily basis once you arrive for planned day trips out. The next nearest town to Kalkan is Kas, a 27km / 30 min drive away. Kas is worth visiting just for the stunning scenery on the coastal road. The nearest large town is Fethiye a 50 minute drive away with its bustling market, harbour and fish restaurants. Many historical sites are within a 45 minute drive of Kalkan including Xanthos, Tlos, and Pinara. Other places of interest are Saklikent Gorge, and the traditional villages of Bezirgan and Islamlar just a short drive up into the Taurus Mountains. Kalkan has 7 major banks all with cash machines accepting most credit cards plus a local post office. Internet cafes and phone shops to stay in touch with home. There are English speaking doctors and a dentist if required. Don’t miss the experience of a Turkish bath or Hamam at the Atlantis well being centre, where there is also a small gym for fitness enthusiasts. Kalkan is well known for its array of excellent restaurants high up on roof terraces in the old town or by the harbour. Don't miss the traditional eateries like Belgin's kitchen with authentic Turkish food, live Turkish music and the chance to smoke a water pipe or the small kebab houses, pide (pizza) and pancake restaurants. Must Do's When In Kalkan: A day trip to Kekova/Simena, Saklikent Gorge and A Boat Trip On Kalkan Bay.